In blender, place chiles with broth, the garlic and 1/4 cup onion. Cover; blend on high speed about 1 minute or until smooth. Place strainer over 5-quart Dutch oven; pour mixture from blender into strainer. Discard solids. Add 7 cups broth, the oregano, thyme, bay leaves and parsley. Cook uncovered over medium-high heat 5 to 10 minutes, stirring occasionally, until flavors are blended. Meanwhile, in 12-inch skillet, heat oil over medium-high heat. Add remaining 1/4 cup onion and the mushrooms; cook 2 to 4 minutes, stirring constantly, until onion is crisp-tender. 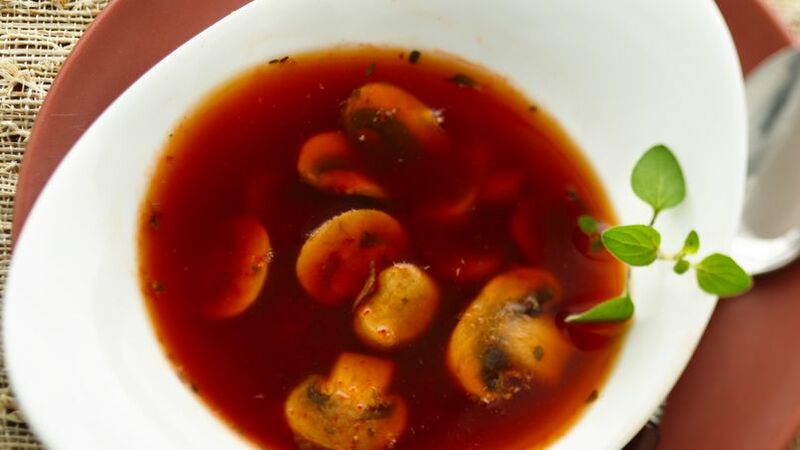 Stir in bouillon and salt; cook over medium-low heat, stirring occasionally, 10 minutes or until mushrooms are tender. Remove bay leaves and parsley before serving.